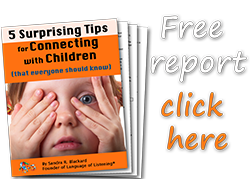 Sign up to receive your FREE REPORT: "5 Surprising Tips for Connecting with Children" and our almost-monthly FREE NEWSLETTER with educational and promotional content. Check your email! The confirmation step tells us this is really you. We value your privacy and will never share your email address with anyone. We also value your time, so you can unsubscribe at the bottom of any email at any time your inbox starts taking over your life!